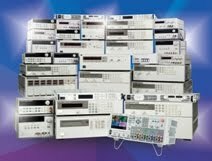 In an earlier posting “Zero-burden ammeter improves battery run-down and charge management testing of battery-powered devices” (click here to access) I had talked about how the Agilent N6781A 2-quadrant SMU can alternately be used as a zero-burden ammeter. 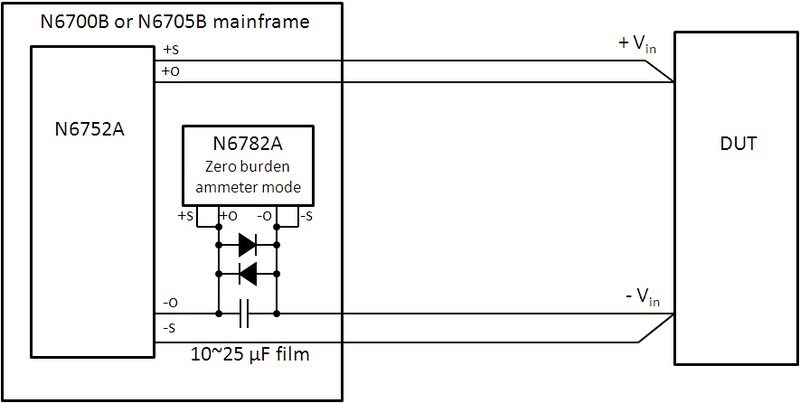 When placed in the current path as a zero-burden ammeter, due to its extended seamless measurement ranging, it can measure currents from nanoamps, up to +/-3 amps, which is the maximum limit of the N6781A. The N6782A 2-quadrant SMU can also be used as a zero burden ammeter. It is basically the same as the N6781A but with a few less features. One customer liked everything about the N6782A’s capabilities, but he had a battery-powered device that drew well over 3 amps when it was active. When in standby operation its current drain ranged back and forth between just microamps of sleep current to 6 or greater amps of current during periodic wake ups. The N6782A’s +/- 3 amps of current was not sufficient to meet their needs. An alternate approach was taken that worked out well for this customer, which was made possible only because of the N6782A’s zero-burden ammeter capability. The set up is shown in Figure 1. The N6752A 50V, 10A, 100W autoranging DC power module provides all the power. The N6782A is set up as a zero-burden ammeter and is connected in series with the N6752A’s output. When current ranges from microamps up to +/- 3 amps the N6782A maintains its zero-burden ammeter operation, holding its output voltage at zero. Once +/- 3 amps is exceeded, the N6782A goes into current limit and the voltage increases across its output, at which point one of the back-to-back clamp diodes turns on, conducting current in excess of 3 amps through it. This all can be observed in the screen image of the 14585A software in Figure 2. The blue trace is the N752A’s output current. The middle yellow trace is the N6781A’s current and the top yellow trace is the N6781A’s voltage. In Figure 2 measurement markers have been placed across a portion of the sleep current and we find from the N6782A’s measurement readback it is just 1.458 microamps average. The reason why this works is because of zero burden operation. 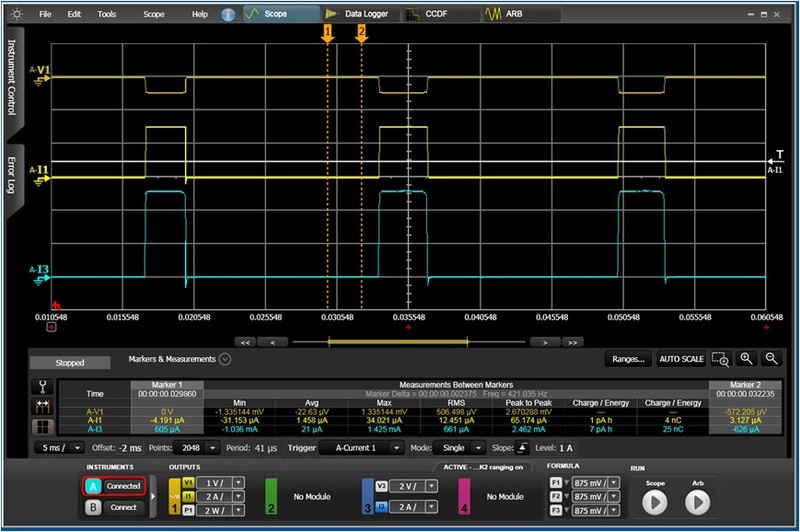 Because the N6782A is maintaining zero volts across its output, there is no current flowing through either diode. If this same thing was attempted using a conventional ammeter or current shunt, the voltage would increase and current would flow through a diode, corrupting the measurement. Now the customer was able to get the microamp sleep current readings from the N6782A and at the same time get the high level wake up current readings from the N6752A! In a similar fashion another customer wanted to perform battery run down testing. Everything was excellent about using the N6781A in its zero-burden ammeter mode, along with using its independent DVM input for simultaneously logging the battery’s run down voltage in conjunction with the current. The only problem was they wanted to test a higher power device. At device turn-on, it would draw in excess of 3 amps, which is the current limit of the N6781A. 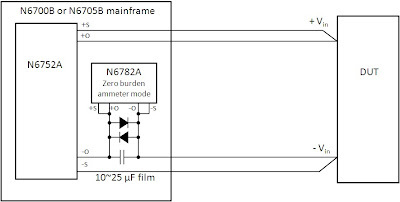 Current limit would cause the N6781A to drop out of its zero-burden ammeter operation and in turn the device would shut back down due to low voltage. 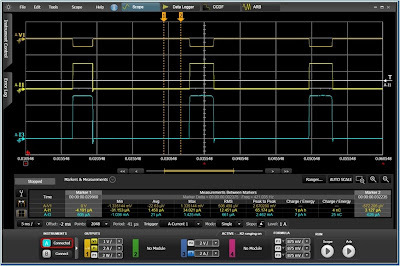 The solution was simple; add the back-to-back diodes across the N6781A acting as a zero-burden ammeter, as shown in Figure 3. Any currents in excess of 3 amps would then pass through a diode. Schottky diodes were used so the device would momentarily see just a few tenths of a volt drop in the battery voltage, during the short peak current in excess of 3 amps. Now the customer was able to perform battery run-down testing using the N6781A along with the 14585A software to log all the results!